Greetings from rainy Athens for the last time in 2011. 5:22- Last home game of the year for the Bobcats. Since they have the division locked up it is a meaningless senior night. Keep it here for updates, especially you who couldn’t stick around due to break. I’ll forgive you. 5:31- Judging from the traffic headaches, this was a really bad idea having a game mix with the deadline for upperclassmen to be out of the dorms. That’s what ESPN will do though. Money 1 Common Sense 0. 5:39- Even with the lack of people expected tonight there was still a line of fans waiting to get in at 5 p.m.
5:44- This senior class has accumulated 35 wins, the most of any class. It’s a shame they won’t have the students around to support them for their last home game. 5:47- A win tonight would give Ohio six straight victories over Miami. Put that on your iPhones Redhawk fans. 5:59- Heading down to the field to take pictures. 6:26- I’m back. Walked alongside the Miami sidelines where one cheerleader was wearing designer boots with her uniform. Miami stereotypes for the win. 6:34- Pics won’t upload so my apologies. 6:38- Ohio needs to score just 15 points to set an all-time record for points in a season. 6:40- More records to watch: Donte Harden is 270 all-purpose yards shy of becoming the school’s all-time single season leader. Kicker Matt Weller needs 15 points to gain that record. 6:49- Alma Matter, Ohio and the anthem have been played. It is now time to honor the senior class. 6:50- Baring something horrible, Tyler Tettleton will be the all-time leader for completions in a season. He needs six. 6:57- As for the Redhawks they have a nice quarterback in Zac Dysert who is coming off a 413-yard performance last week against Western Michigan. 7:02- Rain begins to fall as the teams enter. Miami will receive. 7:08- Miami marching down the field with a furious pace. Five wide receivers on the field every play. Already inside the Ohio 10. 7:13- Curtis Meyers delivers the first big play of the game, sacking Dysert on a 3rd and 2 from the Ohio 2 for a huge loss. Mason Krysinski pushes the 30-yard field goal attempt wide left and the ‘Cats come away unscathed. They are very lucky to do so. 7:16- The sophomore Krysinski has struggled this year making just two of six attempts. 7:19- Just like that, Ohio has to punt. Miami bringing blitzes every play and a sack derails the drive. Tettleton will have to stay composed and make quick throws if this becomes the norm tonight. 7:26- Miami inside the Ohio 10 again and Keller limps off the field with a hammy tweak. Not good. 7:31- Ohio almost gets another goal line stand but Dysert is able to scramble on a 3rd and goal from the 1 to make it 7-0. Defense has been on the field a ton in the first quarter. 7:37-Ohio goes three and out but gets life after a running into the kicker penalty. They have been out of sorts in the little time they have had the ball. 7:42- Weller’s 48-yard attempt misses as time expires in the first. Ohio needed points there. -While Ohio got rolling after the penalty, still disappointing to see them come up short. -Zac Dysert is 10-for-13 for 117 yards. Ohio needs to slow him down as Miami will keep airing it out. -Still no signs of Noah Keller after he was shaken up. The longer he is out, the less chance Ohio will have of slowing down the Redhawks. He is the heart of the defense. -In the quarter, Miami outgained Ohio 125 yards to 59. -Dr. Pepper (10 variety tonight) count at 2 and just cracked open number 3. 7:52- Miami drives to midfield before punting for the first time tonight. Ohio has exploded in the second quarter after slow starts all year. Can they do it again? 7:57- Tettleton finally finds LaVon Brazill for the first time tonight. Miami has been smothering him all night. 8:03- You’d think the Redhawks were down with minutes left in the game with the pace they are playing at. Oregon would be jealous. 8:08- Ohio has 90-yards 4:36 on the clock to do something with this rather forgettable first half for the offense. 8:11- Another record goes down as Tettleton now holds the single-season school record for completions. Now sitting at 218. Ohio driving toward midfield with 3 minutes to go. 8:15- Tettleton can’t find anybody open and the drive gets ugly quick. ‘Cats end up punting on a 4th and 28. 8:17- A shanked punt by Hershey gives Miami a golden opportunity to take the reigns of this game as they start on their own 45 with 1:04 left in the half. -Miami’s secondary is really the difference in the half. Tettleton can’t find receivers and then is forced to take a sack. -Ohio is still right there. One play is all it takes. -Miami leading the yardage battle 217-150. -Zac Dysert making the plays at quarterback, completing 19-of-25 for 185 yards. Nick Harwell has seven receptions for 59 yards. While they have been able to get a bunch of completions, Ohio has done a good job keeping the big plays from happening. -Marching 110 breaks out “Party Rock Anthem” for their last home show. Hopefully that can rally the troops. 8:41- How good has Miami been covering the pass. LaVon Brazill has one catch for six yards. Wow. 8:49- Ohio takes a touchback to start the half. That was the first time they had done so all year. 8:50- Tettleton gets the party started with an 11-yard completion and then a 40-yard run. ‘Cats in the red zone 90 seconds into the half. 8:52- Oh my. Tettleton does all that work only to literally give the ball to the defense on a pick. Jaytee Swanson’s first career pick throws any momentum Ohio gained out the window. 8:56- Ohio gets a 3 and out but a wicked bounce on the punt has it go all the way to the Ohio 10. 59 yard net. 9:00-Tight End Jordan Thompson doing his best Heath Miller impression, taking over this drive. ‘Cats down to the Miami 33. 9:05- LaVon Brazill now leads in all-time receiving yards and single-season receptions. Ohio down to the Miami 5 after an option play to Beau Blankenship. If the ‘Cats don’t score here, they never will. 9:08- Finally six for the ‘Cats. Tettleton finds Thompson in the back of the end zone for the score. Nice comeback drive that makes it 7-7 with 5:49 left in the third. 9:15- Ohio’s defense getting soft again like at the beginning of the game. Miami taking advantage. 9:19- The ‘D’ bends but doesn’t break. Ohio looking to take the lead. -Much better quarter from the Ohio offense. -Defense didn’t as much late, as Miami was only kept off the scoreboard by penalties. -Bobcats took control of the ball that quarter and it showed. TOP difference down to two minutes. 9:27- ‘Cats come up big on the very first play of the quarter. Tettleton finds Foster on a 3rd-and-11 and get all the way down to the Miami 10 but a block in the back brings it back to the 35. Ohio still has life however. 9:29- A botched reverse pass somehow ends up in an 8 yard gain for Riley Dunlop. Tettleton then scrambles inside the 10. 9:31- How about that? Tettleton throws to Foster in the corner for a 4-yard TD that caps a 12-play, 80-yard drive. 14-7 Ohio. 9:34- Though it isn’t as big as the crowds we’ve grown used to during the season, the few that have made it out are into this game an awful lot for not meaning anything. 9:36- With that the announced attendance is 14, 155. Of course that is the number sold. 9:38- Ohio forces a punt and Ryan Clark picks it off the bounce and takes it to midfield on a nice return. Bobcats can put it away here as 10:38 remains in the game. 9:42- TT with a Madden-esque 48-yard scramble to set up a 2-yard pass to Riley Dunlop. 21-7 with 8:43 remaining. This one is over. 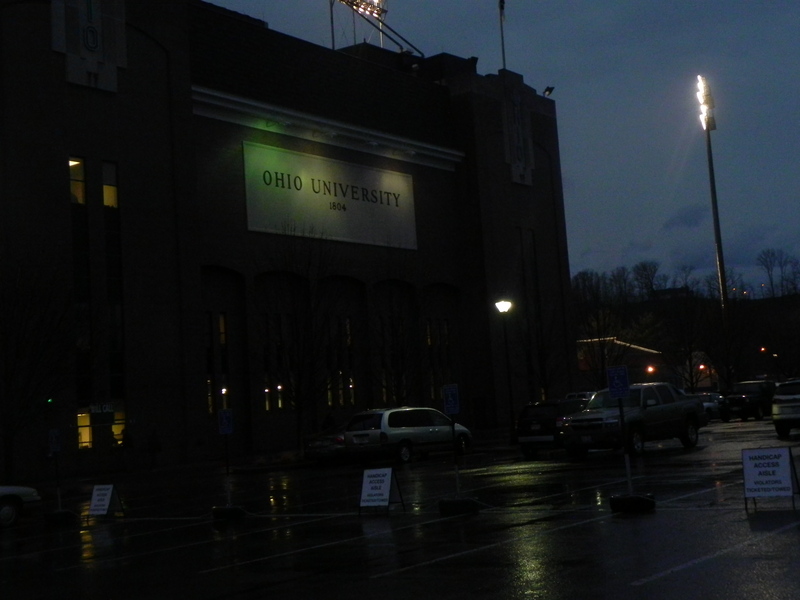 9:47- There is only one way to describe the weather at Peden right now. 9:48- That touchdown makes it 383 points this season for Ohio, an all-time record. 9:51- A wise man once said “not so fast my friend”. Miami storms down the field (80 yards in 2:06) to cut it to 21-14. 6:37 still remain. 9:58- Watch out. Redhawks get a stop and will take over with 4:17 remaining. They will start from their own 17. 10:01- ‘Cats really stumbling. Zac Dysert getting out of tackles with ease. Down to the Ohio 37 with 2:27. 10:06- Keith Moore crushes Dysert for an eight yard loss. Redhawks up a creek now. 10:08- Dysert to Harwell for the 1,000th time tonight and a big gain. Redhawks back in the red zone. 10:11- Mose Denton, sack, goodnight.